A varmint hunter's delight! CCI® .22LR Subsonic Ammo keeps the volume level down low and offers consistent accuracy and flawless cycling. 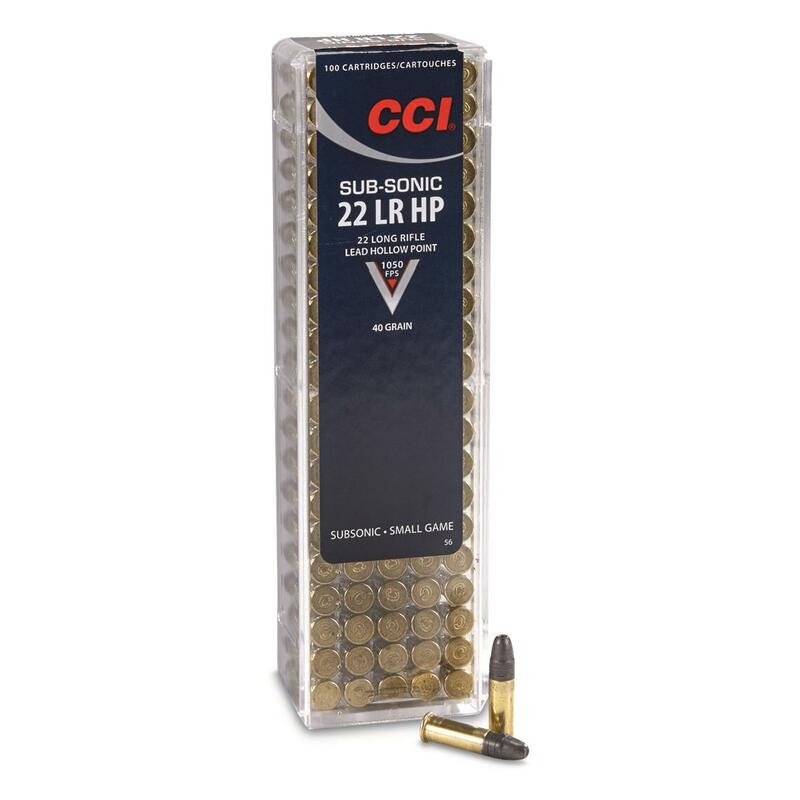 CCI Subsonic, .22LR, LHP, 40 Grain, 100 Rounds is rated 5.0 out of 5 by 3. Rated 5 out of 5 by StP Deadeye from Dead on! And quiet. Custom built 10/22 using CCI subsonic. Awesome stuff. Hitting dime size groups at 50 yards. Took 4 squirrels on first trip through the woods. I just had to pick up more, just in case they sold out, now I'm stashing away 400 plus rounds of these. Very light on the recoil also. Easy enough, and luckily enough, I can stop into retail store, order at desk and pick up right away. Rated 5 out of 5 by Carl Gustav from Very accurate Shooting this past Thursday morning in less than ideal conditions, 0 degrees, this ammunition in an H & R Model 12 target rifle produced the best group of 5 at 50 yards at 5/8". The other three groups of five were two at 1 3/16" and one at 7/8" and I was responsible for those not being better. I had just acquired this ammunition for Sportsman's Guide. Rated 5 out of 5 by Mobuck from Believe this or don't Shooting this ammo through a suppressed Ruger 22/45 w/4" barrel and a FastFire using a sandbag rest allows consistent hits on an 8" round gong at 100 yards. Most hits are grouped in a 4" area. I don't have a db meter but this is also one of the quieter sub-sonics. The HP does actually mushroom on critters at close range.